I have a special surprise for you today: I am so honored to be guest posting over at Just One Cookbook! Although Nami and I have never met I feel like we are friends. Even through emails and blog posts I can tell that she is a warm, kind soul who always tries to make time for everyone. I always enjoy emailing with Nami about blogging and food, and I want to try every single gorgeous dish that she makes. I feel so lucky to have Nami as a blog friend. Living in Israel, I’ve been exposed to so many new cuisines. Bourekas, a kind of savory turnover, have become a staple of my diet and are the inspiration for this recipe. They are common throughout the Middle East, Mediterranean, and North Africa and come with all kinds of fillings, from potato to “pizza.” Spinach and feta is one of my favorite flavor combinations, and it works perfectly here. These are great for brunch, but work just as well as a breakfast on the run. I like to freeze some to reheat them for an easy snack. Thank you Nami for having me! 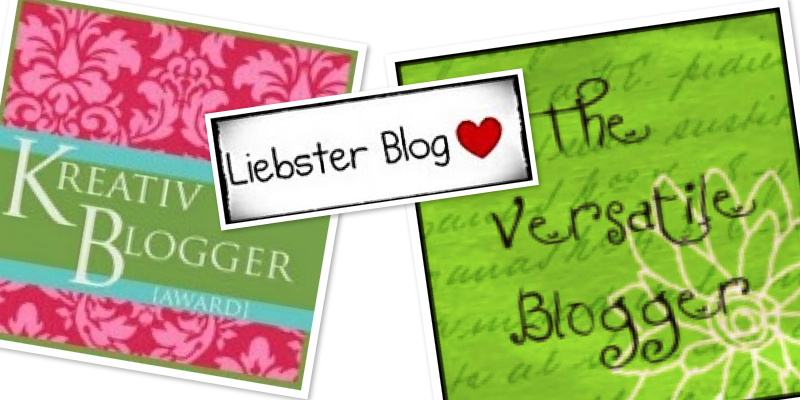 Also I have been honored to receive some blog awards from incredible bloggers. Thank you to Melissa from Chin Deep for passing on the Kreativ Blogger Award, Sofie from German Foodie for passing on the Liebster Award, and Tess from Slow Cooking Kitchen for passing on the Versatile Blogger Award. Please go check out all of their wonderful blogs – they each have sensational recipes, great photos, and incredible people behind them. Girls I love your collaboration guest post, its so exciting! I hope to make your turnover soon. Can you recommend me some other veggie instead of spinach, that would be awesome! again, thanks for sharing Katherine! Thanks Helene!! Any leafy green would be great here, like chard or kale. Sorrel would be nice and would give it a citrusy taste so you could omit the lemon juice. Or you can completely change up the filling. Make it mushrooms and onions or sausage and cheddar. I don’t know, just throwing out ideas 🙂 I bet you could make an incredible Indian-inspired turnover! I love spinach and feta together and your turnovers look great. Off to Nami’s now! It’s such a great combo, isn’t it?! Thanks Maureen! Congrats Katherine on your first cook book. It looks amazing. I have had something similar to these turnovers at a Lebanese restaurant and I loved them especially their seasoning. Hopping over Nami for the recipe. Thank you so much! I’m so excited about it 🙂 I can definitely see you having something similar at a Lebanese restaurant, this kind of dish is popular throughout the Middle East. The turnovers look great, they look so like samosas 🙂 I am reading about your cookbook…that is so great….has it come out yet? Where can I find the details? Thank you Suchi! They are a bit like samosas, which I also love! But baked instead of fried (ooh but I bet they’d be amazing fried! I see you found the cookbook details – I hope you enjoy it!! Hmmmm, I’ve been looking forward to trying these, but now that I know there’s a potato version I have to ask you for a recipe for it. Any chance we could get one in a few posts? Hahaha I’ll have to make that one next Lori! Just for you 🙂 Potato bourekas are one of my favorites. Congrats on you new e-book. 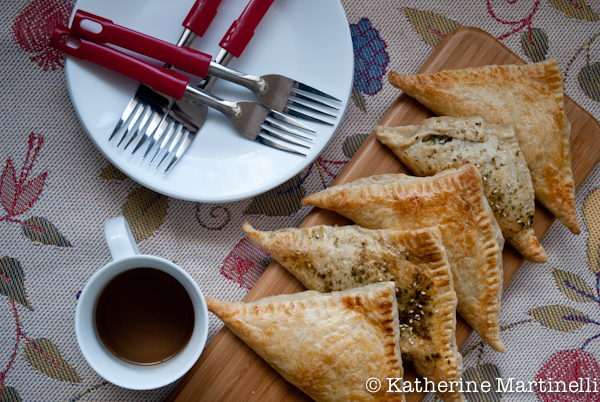 These turnovers are fabulous and also a lovely guest post over at Nami’s. Have a wonderful day. I am a huge fan of the spinach and feta combo too! These look absolutely delish! I’ll head over to Nami’s page to check out the recipe. YUM!! I am a big fan of puff pastry! Your cookbook is on my list. This savory idea for using puff pastry will be a big hit in this house – that’s for sure. Thank you for sharing it! I love you both and I love these turnovers! These turnovers look so fabulous! Great post, Katherine! I love spinach and feta together! Thanks Cassie! It’s a match made in heaven for sure. I am here after a long time and can’t think of a reason why I haven’t been visiting your blog (I have been missing out on some good stuff!) Those turnovers look great and congrats on the new e-cookbook! How exciting! I saw your guest post today at Nami’s; these turnovers sound delicious and I can’t wait to make them! Really nice pictures, the top one in particular. Would like to see that one a bit bigger. on my way to check out the guest post . . . I saw these on Foodgawker today! Or was it Tastespotting? Or both? Either way, I thought they looked fabulous. Heading over to check out your guest post now. I ate a few bourekas while I was in Israel. Who can resist flaky pastry and salty cheese? Personally, I liked anything their sprinkled with Zatar. Came home with some great stuff from Mahane Yehuda and forgot to tell customs about it. Shoot! Aren’t bourekas great? Zaatar too. Love that you visited and got to go to Mahane Yehuda! Thanks! Isn’t she the best?! Off to go check out the post! I love all things spinach and feta…major yum. Thanks Joanne! Hope you enjoy. It’s such a great flavor combo! Congratulations for your e book. Just checked your recipe at Nami’s. The addition of zatar would make it taste middle eastern. I love the mixture of this herbs. Thanks Balvinder! I love zaatar, it’s such a great spice blend! Thanks Terra! It really is a great snack on the go, any time of day. Congratulations on the launch of your new cookbook. It looks fabulous, and so do these turnovers. I write the same things I wrote to Nami..
Two of my favorite bloggers together… what can I ask more?! These turnovers are delicious.. I love the combination between feta and spinach (and I love both separately :P)! Thanks Nic! It really is a great pairing, isn’t it?! Hello, came over from Nami’s place. Loved the guest post and these turnovers are fantastic!